I'd like to turn this post into one of the internet's BEST resources for Kamado Cooking! Applewood Smoked Meatloaf - John Setzler / Kamado Joe Jr. Sandwich Style Roast Beef - John Setzler / Kamado Joe Jr.
Baby Back Ribs - John Setzler / Kamado Joe Jr.
Bacon Explosion - John Setzler / Kamado Joe Jr. Pulled Pork BBQ - John Setzler - Kamado Joe Jr. Grill Fried Chicken - John Setzler / Kamado Joe Jr.
Roasted Rack of Lamb - Pitmaster X / Big Green Egg MINI! Seared Ahi Tuna - John Setzler / Kamado Joe Jr.
Twice Baked Potatoes - John Setzler / Kamado Joe Jr.
Good idea, John. I enjoy watching the videos of others, and always learn something from them. John what temp did you cook the salmon for? I don't think I have ever put a meat probe in fish. Its one of those things I can tell when it's done by looking at it.. Exactly. I've never probed fish. A couple rules of thumb, if it's a flaky fish like a salmon, it's done when you start getting some uniform separation of the flakes, that is, when you touch it they give to a little separation, yet still springs back up to its original shape. Most fish have a pretty long window of cooking time, and what is done enough to be safe from a health perspective, may not be done enough to your liking for personal taste and texture. I find that most people tend to slightly overcooked their fish. A couple large salmon fillets, on the extended rack of a Kamado, at 359-375° should not take more than about 25-30 minutes total, no need to flip, just ad your fav wood , put the lid down, wait 20-30 minutes, and eat. Thanks, I tried the beer can chicken yesterday and my friends and I were in agreement, it was the moisted, tenderest chicken we have ever had. I am looking forward to trying more of these video recipes. Pork - Baby back ribs, a technical overview. BbqScientist - good video and nice exposition. I particularly liked your salt discussion and the 30X! I like the way you laid in the music. Nice cook! Nice dawg you've got there. 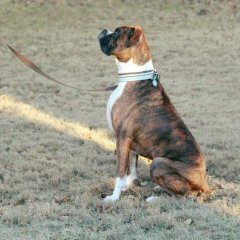 I'd like to see him running around the back yard at 30X! Thanks! I'm going to continue making these, next week is either a leg of lamb or a turkey. I cut out 15 minutes of what I consider critical info but others might call it rambling. And I have a lot to work on with my hemming and hawing, and videographer "skills"
I'm thinking of breaking them down into separate topics: 'cleaning and lighting the kamado' 'seasoning meat' 'science of smoke and using different woods' etc...... Rather than trying to cram that info in alongside a cook video. 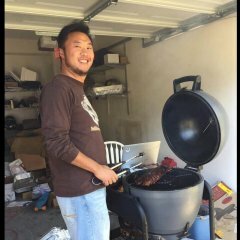 All kamado oriented videos.. The pup is our first born son........ Wonderful dog.